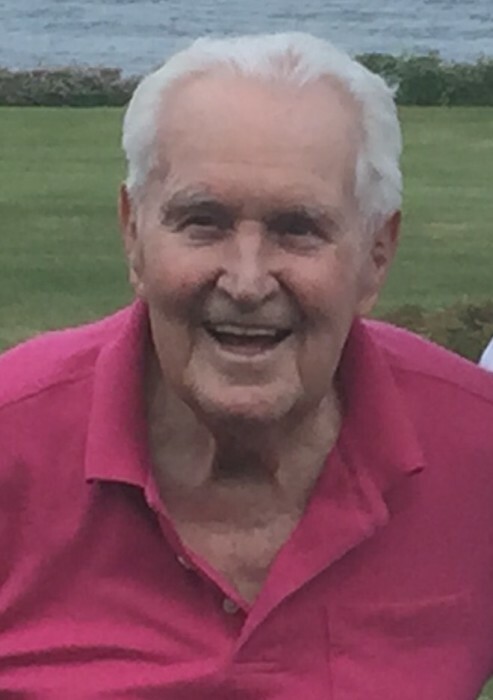 Jackson H. Dutton, age 94, passed away peacefully in the Season’s Hospice Center in Milton, Massachusetts on Tuesday, April 2, 2019. Born in Brockton, Massachusetts on December 20, 1924, he was the son of the late Wallace E. and Susanna M. (Hall) Dutton. While he was raised in Sharon, Massachusetts, Jackson’s family has strong ties to Vermont. His Grandfather and Grandmother lived in Brookfield, VT (home of the Floating Bridge). As children, each summer Jackson and Ollie would journey and stay at their Uncle Harry Batchelder’s farm. Back at home in Sharon, he graduated from Sharon High School with the Class of 1943. Following graduation, Jackson enlisted in the United States Army Air Corps, proudly serving his country during World War II. He was stationed with the Hq & Hq Squadron 7th AF Service Command, serving in the Asiatic Pacific Theater of Operations. Jackson was honorably discharged in June of 1946, after earning the rank of Corporal. Upon his return home from the Army, Jackson enrolled in Boston College, earning his bachelor’s degree in 1951. Jackson married his beloved wife, M. Patricia Lydon, on October 17, 1953 in Saint Margaret Mary’s Church in Westwood. The young couple made their home together in Sharon, Massachusetts and Jackson began working in the insurance business in 1955. He worked 5 years for Baird Atomics but then joined New England Life Insurance Company and represented the company and Arbella Insurance as an Independent Insurance Agent for 40 + years. He had operated Jackson H. Dutton Insurance business in Sharon, MA. Jackson and Pat (Pastor & Founder) were active members of Emmanuel Prayer Group. The congregation would worship in their home in Sharon. Members of EPG would make annual pilgrimages to Israel to celebrate the Feast of Tabernacles as defined in the Book of Ester. Jackson was very proud of his relationship with the Lord and EPG’s Ministry of singing and dancing to expressing their joy of the Lord. Jackson was an avid “Outdoor Man” – he loved fishing, hunting, skiing, swimming, and gardening. In fact, he operated three large gardens in Sharon and Springfield, VT. If Jackson’s hands were not dirty, then he felt he wasn’t working hard enough. However, most of all, Jackson loved and was proud of his family, grandchildren, nieces and nephews, as well as his new and long time friendships. Beloved husband of Patricia (Lydon) Dutton. Loving father of Barbara A. Ferrara and her husband Steven C. of Sharon, Deborah M. Dutton and her husband Peter M. Young of Westwood, Gregory M. Dutton and his wife Lori G. of Franklin, Patricia A. Dutton Conway and her husband Jeffrey M. of Malvern, PA, and the late Jackson H. Dutton, Jr. Cherished grandfather of Christopher Ferrara, Andrew Ferrara, Barrett Conway and his wife Amy, Patrick Dutton, Addison Conway and his wife Alexa, and Emily Dutton. Brother of the late Oliver F. Dutton and his wife Renee. Relatives and friends are kindly invited to attend Jackson’s Life Celebration on Friday, April 5, 2019 from 4 to 7 PM in the James H. Delaney & Son Funeral Home, 48 Common Street, Walpole. A Funeral Service will be held in the Victory Church, 67 High Plain Street (Route 27) Sharon on Saturday, April 6, 2019 at 10:00 AM. Interment will follow in Rock Ridge Cemetery in Sharon. In lieu of flowers, memorial donations may be made to: New England Center and Home for Veterans, P.O. Box 845257, Boston, MA 02284-5257.